Its formula with proven efficiency takes care of your skin. 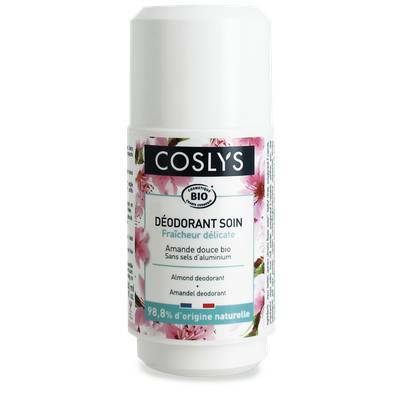 This deodorant does not block perspiration and fight against bad odors and bacterial proliferation. A unique combination of natural dermo-purifying active ingredients enables to control body odors while the combination of clays and rice powder allow to regulate perspiration by absorption. Meadow sweet floral water*, aloe vera* and sweet almond oil* soothe the skin and reduce inflammations. Lemon essential oil * is renown for its astringent and purifying properties. Its fragrance of sweet almond oil brings a feeling of freshness and comfort. Aqua (water), spiraea ulmaria flower water, triethyl citrate, polyglyceryl-4-caprate, propanediol, oryza sativa (rice) hull powder, polyglyceryl-3-caprylate, xanthan gum, aloe barbadensis leaf juice powder, candida bombicola / glucose/ methyl rapeseedate ferment, bentonite, sodium caproyl/lauroyl lactylate, prunus amygdalus dulcis (sweet almond) oil, parfum (fragrance), benzyl alcohol, sodium cocoyl glutamate, lactic acid, dehydroacetic acid, potassium sorbate, sodium benzoate, citric acid, rhamnose, tocopherol, glucose, glucuronic acid, linalool, benzyl salicylate, limonene, geraniol.